I think sometimes its important to put things in perspective. I'm railing hard against my perfectionist tendencies in general and trying to remember to embrace an "it's better done than perfect" attitude with regard to my quilts. I love our pile of lap quilts. But it does drive home the idea that they don't have to be perfect to be enjoyed. So when those points don't match up perfectly or the quilting is somehow not up to my standard, I like to remind myself that "it'll look great wadded up on the couch." What are your strategies for letting go of perfection while quilting? 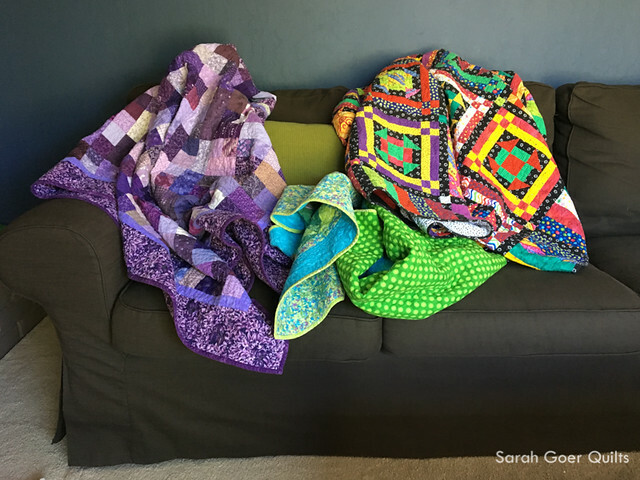 Posted in Quilting on April 20, 2017 by sarah. Thank you, Yvonne. I think I understand your point of view. 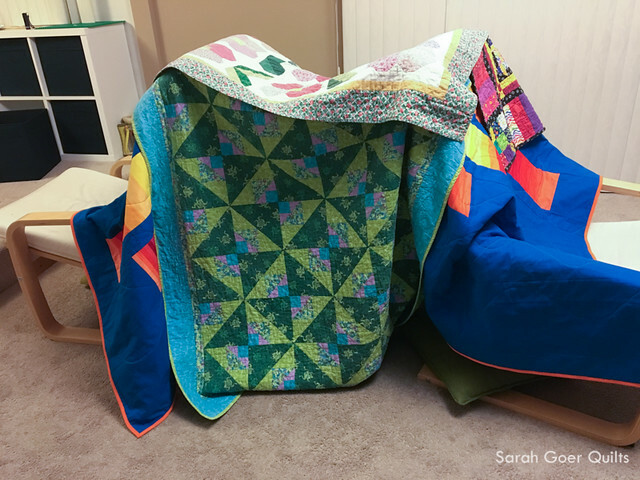 When I started free motion quilting I never worried about not being good, because I was just so thrilled that I was doing it! Right now I'm in a place where I don't have enough time to do all of the things I want to do. So I'm letting the free motion quilting take a backseat. I know I could improve if I spent time on it. It's just not a priority at the moment. Hello. I am new to all this blogging so I'm real excited. I love your quilts. In the second photo that has red and yellow... The squares. What do you call that? I absolutely love how you did that. Also, is is paper pieced??? ( please say It's not) 😳 Good luck with all your projects and I truly look forward to your reply. Thank you for your kind words, Denise. The quilt you referenced is Candy Shoppe (my title, but not my design). The block is a churn dash in the center. Then the border is pieced with strips and 4-patches in the corners. None is paper piecing. :-) I'm sorry that I can't point you to the pattern, but I'm sure you can find something similar if you look for churn dash blocks/quilts. The best way for me to curtail my perfectionist tendencies is to walk away from a project. It's easy to focus on wobbly quilting or not-quite-right points when I'm at the machine, just inches from the problematic spot. But when I put the project down for a few days and return to look at it with fresh eyes, the feature that was so hideous at first often has become more tolerable and I decide it's not worth the effort to fix. This is a great idea. Sometimes when I'm feeling stuck on designing a project fresh eyes at a later time is really helpful. It would be helpful for better assessing a mistake, too! Before I started quilting, when my mother would show me (or give me!) a quilt, she would immediately start pointing out all of the quirks that she perceived as mistakes. So I would tell her not to do that! Because I wouldn't have noticed, and even if I did notice, I wouldn't care, and would probably love it more, because handmade is naturally imperfect, and who WOULDN'T love to have something handmade with love for them, especially from their mom? Unfortunately, now that I'm a quilter, I have to keep telling myself that. This is something that many of us are guilty of. I try to only point out (and complain about) my imperfections to a couple close friends (who I share process pics with). Then I try to keep my mouth shut when others are seeing my work. ;-) Thanks for visiting, Becca! This made me laugh. Our quilts are 1) "loosely folded" up on the couch, 2) being used as random stuffed animal bedding, and 3) (because we have sooo many baby sized quilts) rolled up with rubber bands and tucked under the edges of my toddlers mattress pad like small berms so as to prevent him from falling out of bed at night : D hahaha Needless to say, no mismatched points are preventing them from getting used! Indeed! Your house sounds so lovely and quilt-filled! Thanks for visiting, Sarah!